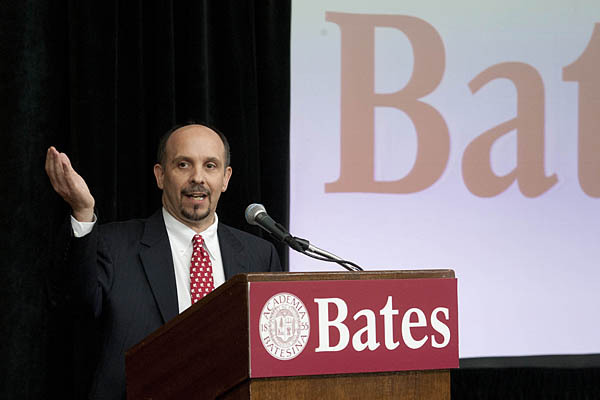 Jamie Merisotis ’86, a Bates trustee and a dedicated advocate for improved access to higher education, moderated the symposium. Everyone knows the big story about higher education: The price of college is out of control. That story sets the tone for media coverage of higher education, and it’s the story that keeps parents awake at night. While the cost of higher education is certainly rising, a group of national leaders in higher education told an Oct. 29 gathering at Bates, that cost is neither inflated nor out of proportion with the considerable benefits of a higher education. 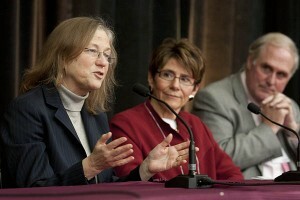 View video clips featuring each symposium speaker. Read “Education experts defend price of college degree,” the Hechinger Report’s coverage of the symposium by Jon Marcus ’82. This was the message that dominated the Leadership Symposium on College Cost, Price and Financial Aid, held at Bates and co-hosted by Brown and Northeastern universities. Suggested by Bates board chair Michael Bonney ’80 and convened by President Nancy J. Cable, the afternoon symposium brought some 100 education professionals to Perry Atrium. and James S. Miller, dean of admission at Brown. 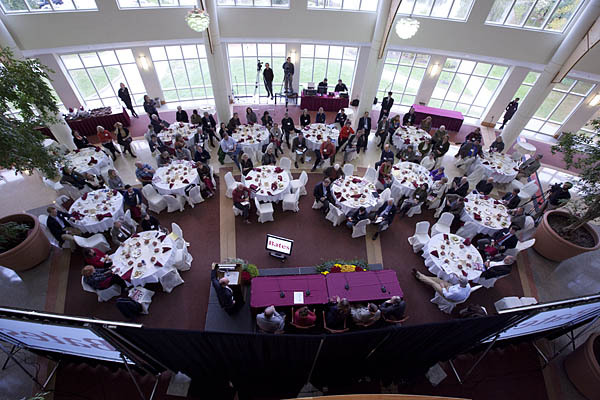 The symposium filled Perry Atrium just hours before an Oct. 29-30 snowstorm stunned New England. Demand for higher education is “dramatically higher,” he said, and the market’s demand for employees with degrees is greater than it has ever been. Degree-holders on average take home 84 percent more compensation than non-degreed workers, up from the 75 percent premium of a decade ago. Two-thirds of all positions created in the next decade will require at least a bachelor’s degree. And today, without some kind of post-secondary credential, people are much more likely to be unemployed, and to make low wages when they are employed. 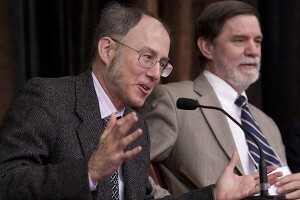 Summarizing their data and arguments from Why Does College Cost So Much?, Archibald and Feldman convincingly refuted the common wisdom that college costs are out of control, running away thanks to bloated administrations, effete tenured faculty and “country club” expectations of comfort and service — all of which the economists labeled as the “dysfunction narrative” usually cited in the media and by critics of education. Instead, these increases result from systemic factors affecting other industries too — for example, health care and legal services — and the increases in educational cost parallel the increases in those fields. All of these services can be delivered only by highly educated, highly skilled professionals whose high salaries are determined by the market; and are fields in which productivity cannot be dramatically improved through technology, unlike in manufacturing. The latter illustrates the phenomenon called “cost disease,” where certain segments of the economy see costs rise as rising productivity in other segments forces prices down. In addition, higher education is unique in that colleges and universities are obliged to prepare students for the real world by recreating that world in microcosm, incurring expenditures — from travel to technology to financial aid — that doesn’t directly drive productivity but is essential to quality. Feldman and Archibald offered the concept of an “unholy trinity” or “iron triangle” that rules the college-cost equation. The three elements are tuition and fees, subsidies to schools (whether from government, endowment or gifts) and the quality of education — and you can’t change one without changing another. If subsidies drop, either you raise tuition or reduce quality. Sandy Baum, professor emerita of economics at Skidmore College, makes a point while Jane Bode Brown ’69 of Northeastern University listens. Currently, about two-thirds of college students receive some sort of financial aid. As demand for higher education grows and the gulf in earnings widens between the richest Americans and everyone else, the resources to support aid will become scarcer and scarcer. Miller and others pointed out that, despite the common wisdom that college costs are out of control, higher educational institutions are actually serving as a bulwark against the widening income gap: Especially for state schools hard-pressed by falling state appropriations, the rise in the college “sticker price” is driven largely by subsidies, in the form of grants or scholarships, for less affluent families. As Miller said, any other industry whose product was as much desired as higher education would follow the rule of supply and demand by raising prices. Instead, higher education is containing price increases. 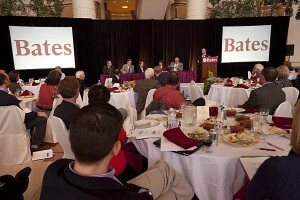 The symposium on college costs brought about 100 leaders in higher education to Bates. The panelists were clear that when the curtain goes up on the topic of access to college, the spotlight is usually on the wrong actors.